However, not many people are aware of the fact that they are the ones who can make the change and transform their body and life in a very short period of time. If you’re one of those people who simply don’t have the time or desire to hit the gym you came to the right place. There are some awesome exercises that you can do in the comfort of your home and still achieve amazing results. You need to lie on your back with the knees bent and feet flat on the floor, hip-width apart and then you need to place your hands behind your head. 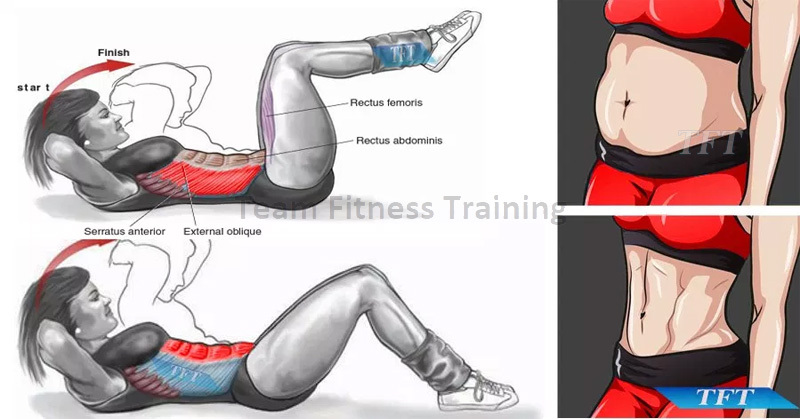 Next, you need to gently pull your abdominals inward. Then you need to curl up and forward so that your head, neck, and shoulder blades lift off the floor. Then you need to hold the position for a few seconds and slowly back down. Repeat it 10 times. First, start with the pushup position so that your upper part of the body must be straight in line with the elbows. And then toes when they are slightly raised and keep up this straight position, take deep breaths, and feel the muscles getting strong. You need to make sure you contract the buttock muscles, equally divide the weight into both legs and elbows to have more strength and balance. First, you need to stand with your feet shoulder-width apart and your hands on your hips and then to step forward with one leg and flex your knees until your rear knee nearly touches the floor and after that, you need to bring your body back. Then switch legs and repeat it 20 times. Next, you need to rotate your torso and bring your right elbow to your left knee and then repeat after switching to the other side. You need to perform 3 reps of 1 minute each.